In one of the most exciting developments the coin collecting community has seen, a hoard of U.S. gold coins valued at $10 million was discovered by a couple walking their dog in northern California. The coins had been buried in tin cans that had since rusted and rotted through. The gold coins, however, withstood the test of time due to the chemical properties of gold. After being fully cleaned, the coins will be sold online and privately to collectors. The 19th century coins are being dubbed "The Saddle Ridge hoard" after the place in Sierra Nevada where they were found. In total, the couple dug up 1,427 coins in eight separate cans from their property. The vast majority were $20 coins, with a few $10 and $5 coins as well. After cleaning, it was found that approximately one third of the coins were in pristine condition and 13 of them are either the finest preserved examples of their kind or tied for that status. 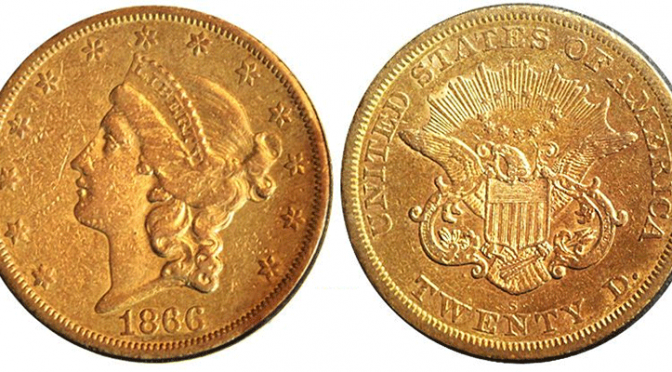 The rarest coin of the bunch is an 1866-S No Motto Double Eagle, a $20 coin that was stamped without the motto "In God We Trust." This one coin alone is expected to sell for $1 million. Another rare find is a $5 coin minted in Dahlonega, Ga., in 1849 during the facility's short 23 year run. Despite conducting extensive research, it is unclear who buried these coins here in the first place. The hoard was found in the foothills of the Sierra Nevada mountain range, the locus of the California Gold Rush in the late 19th century. The buried treasure trove evokes images of the lawlessness of California during that time. The Gold Rush started in 1848 when gold was found in the American River at Sutter's Mill. At the time of the discovery, California was still technically under Mexican control, though being occupied by American military forces. California would be ceded to the United States as a result of the Mexican-American War. After the influx of prospectors during the mid-1800s, the area came to be known as Gold Country. The gold coins represent the largest buried treasure found on American soil. Pieces from the collection will be on view at the American Numismatic Association show in Atlanta. Coin collectors can browse and bid on lots from rare coin auctions all over the world at iCollector.com.